Honest and rigorous analysis of self and society is an essential requirement throughout the life journey of any individual who seeks to make a contribution to advancing humanity. This is one of the many invaluable lessons that Sister Thandiwe Chimurenga learned from the great teacher and immortal Pan-Africanist, Kwame Ture. Sister Thandiwe’s analysis of self and human society has taken a qualitative leap forward since she joined the All African People’s Revolutionary Party in 1988. During those student years she successfully completed an Honors Bachelor of Arts Degree in Political Science and Latin American Caribbean Studies at York University. Other academic qualifications from universities and a college in England include: a Bachelor of Law degree from The University of Buckingham; a Master’s degree in International Commercial Law from The University of Nottingham and; a diploma in legal practice from the College of Law in England. This she-warrior is committed to the struggle to liberate Mama Africa and African people. This is clearly demonstrated by her willingness to travel where the African Revolution requires her to go. Sister Thandiwe has been selected to participate in AAPRP delegations to Libya, Uganda and Azania (South Africa). In November 2000, the All African Women’s Revolutionary Union (the women’s wing of the AAPRP) voted for Sister Thandiwe and the Immortal Queen Warrior Mawina Kouyate to attend the herstoric 20th anniversary meeting of the AAWRU, which was hosted by the Democratic Union of Guinean Women in Guinea Bissau, West Africa. Following three years of planning, the meeting was a momentous occasion for she-warriors in various African organizations in Africa to engage in serious discussions on how to achieve a Unified, Socialist Africa. Sister Thandiwe has faithfully served as a member of the Central Committee (“CC”) of the AAPRP from 1996-2000 and was re-elected for a second term in 2003. During her first term on the CC she served as the secretary of the All African Women’s Revolutionary Council. 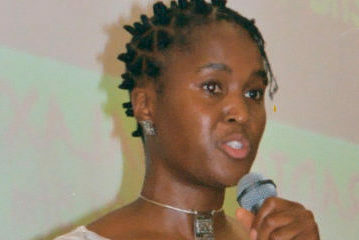 She has a wealth of experience organizing for and with African women, the most oppressed sector of the African nation. Sister Thandiwe currently resides in Canada. She has delivered stimulating presentations to audiences on college and university campuses and has been interviewed by radio stations in Africa, Canada, the USA and England.